Brass House Numbers and Brass Letters - - solid brass raised numerals from 0 to 9, letters from A to Z, and four punctuation marks: ampersand, comma, period, and dash. All characters are 4" high. The finish on all numbers, letters, and symbols above is polished brass lacquered. With 16 different finishes, you're sure to find one that is perfect for your home. Individual numbers are 4" high and range from approximately 1.3125" to 4.125" wide. Letters range from 3/4" wide (letter I) to 3-1/2 (letter A). If space is a limitation, please measure carefully before ordering and contact customer service for confirmation. Characters can be arranged vertically or horizontally. Special Order. Sorry, we do not accept returns on these 4" House Numbers and Special Characters. Brass House Numbers and Brass Letters. 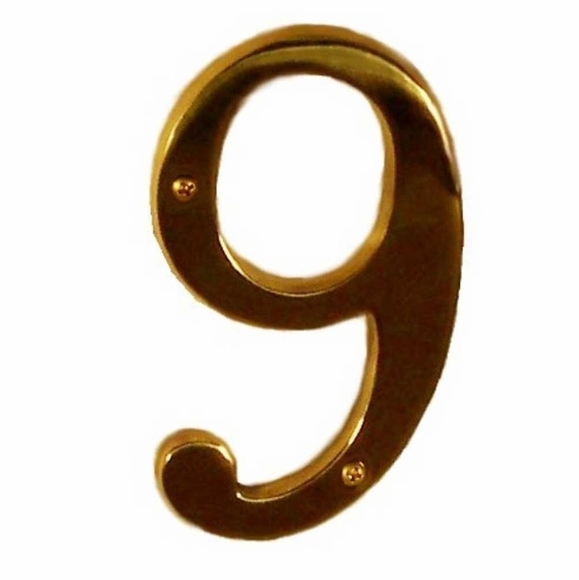 Solid brass raised numerals from 0 to 9, letters from A to Z, and four punctuation marks: ampersand, comma, period, and dash. Numbers and letters are 4" high.